IT professionals from around the world rate technology solutions on Gartner Peer Insights. Free of any vendor influence, this site gives a detailed perspective and firsthand experiences from frontline experts who have chosen and implemented a wide range of solutions. It is hosted and verified by Gartner, the trusted analyst firm that delivers technology research to global business leaders. 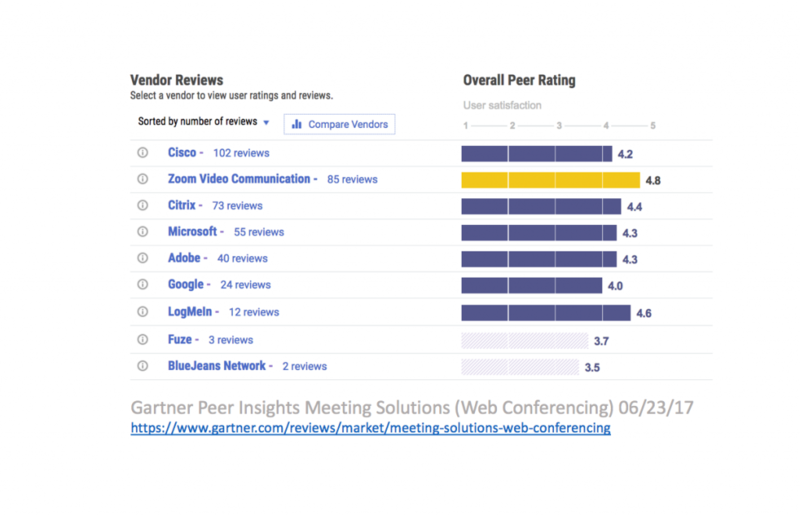 Zoom is pleased to announce that we are a top-rated video and web conferencing provider on Gartner Peer Insights! Our current rating of 4.8/5 puts us above other ranked vendors including Cisco, Citrix, Microsoft, Adobe, Google, LogMeIn, Fuze, BlueJeans Network and others. Check out the rest of our rave reviews and/or write your own on the Gartner Peer Insights Zoom review page. Note: no special accounts or logins required. PS. Gartner’s analysts also reviewed Zoom! Check out the Gartner Magic Quadrant for Web Conferencing.